Hundreds-of-Millions of Muslims are Going to Burn in Hell Forever for Rejecting Jesus Christ! Kindly said, Muslims who reject Jesus as the Son of God and the Christ are not saved. They do NOT have the Father without the Son. You can only have the Father through faith in the Son. God calls Christ-rejecters LIARS and ANTICHRISTS!!! As our text Verse warns in John 3:36, God's wrath ABIDETH upon all Christ-rejecters continually!!! If you have knowingly rejected Jesus Christ as the payment for your sins my friend, then you are living dangerously on borrowed time. Hell is just around the corner for you, and will last for all eternity. Jesus DIED, was BURIED and ROSE AGAIN three days later from the grave. This is the Gospel (1st Corinthians 15:1-4). Jesus shed His blood to pay your sin debt and mine (1st Peter 1:18-19). Note that all Scripture references are only from the trustworthy and inspired King James Bible. Hell is no joking matter friend. The highway to Hell is real. Please don't choose Hell instead of Heaven. Why would you do such a foolish thing? Whether you believe that a literal burning Hell exists where unrepentant sinners will spend eternity is irrelevant from the fact that it truly does exist. You may not believe in electricity, but drop a radio into your bathtub without a ground fault circuit interrupt (GFCI) outlet and see what happens. Goodbye Charlie! Many people have been electrocuted over the past half century by electrical appliances falling into their bath water. ZZZHHHH!!!! Even after ten trillion years, it won't even be the beginning of your eternal damnation, torment, misery, loneliness, regret and agony in the Lake of Fire. Perhaps you think that a God of love wouldn't put any of His creatures into Hell to be tormented. Look around you at all the suffering, torment, starvation and utter misery and pain in this sin-cursed world. If God allows suffering on earth, what makes you think that He won't cause suffering in eternity for those who caused most of the suffering on earth? 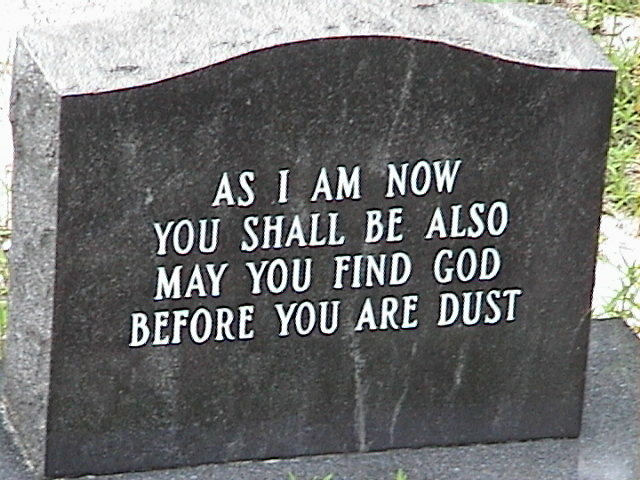 Do you really want to be separated from God, your Maker, for all eternity, abandoned and forgotten about? Judgment Day is coming for every INDIVIDUAL who has ever walked this earth. Ecclesiastes 12:14, “For God shall bring every work into judgment, with every secret thing, whether it be good, or whether it be evil.” The Bible is filled with stern warnings about coming judgment from God in eternity. Proverb 24:12, “If thou sayest, Behold, we knew it not; doth not he that pondereth the heart consider it? and he that keepeth thy soul, doth not he know it? and shall not he render to every man according to his works?” (see also Matthew 7:2; Matthew 12:36; Romans 12:14; Romans 14:10-12; 1st Thessalonians 4:6; 2nd Corinthians 5:9-11; Hebrews 9:27 and Revelation 20:11-15 to mention a few). Man's day of reckoning before God is coming my friend! Nearly one billion Islamic Muslims believe the Koran's heresy that Jesus was kidnapped and someone else died on the cross instead. That's right, Muslims don't even believe that Jesus died on the cross!!! According to the Islamic holy book, the Koran (or Quran), Allah has NO SON. Thus, Allah is a false god, not reality. The King James Bible teaches that there is only one God (Deuteronomy); but that God exists in three separate Persons (called the Godhead in Acts 17:29, Romans 1:20 and Colossians 2:9). The teaching of the Godhead is found in Matthew 28:19-20 and numerous other Scripture passages. Some call this the doctrine of the Trinity, but I use the word GODHEAD (which is found in the King James Bible and the original Greek manuscripts). Allah is NOT the SAME GOD that Christians worship!!! The Quran unashamedly calls Muhammad’s god the best liar and deceiver of them all! The Quran describes Allah as the best deceiver there is, a liar who is not above using the same evil and wicked schemes of his opponents. Thus, the Quran unashamedly calls Muhammad’s god the best liar and deceiver of them all! I love Muslim people; which is why I must expose Islam as a fraud and Muhammad as a liar. John 8:44 calls Satan the father of all liars. The Quran calls Allah the deceiver of all deceivers. They sound like the same person to me. They're both lying, deceiving, cutthroat scoundrels. Allah is a fraud. Muhammad was a false prophet who worshipped the moon. Islam is of the Devil!